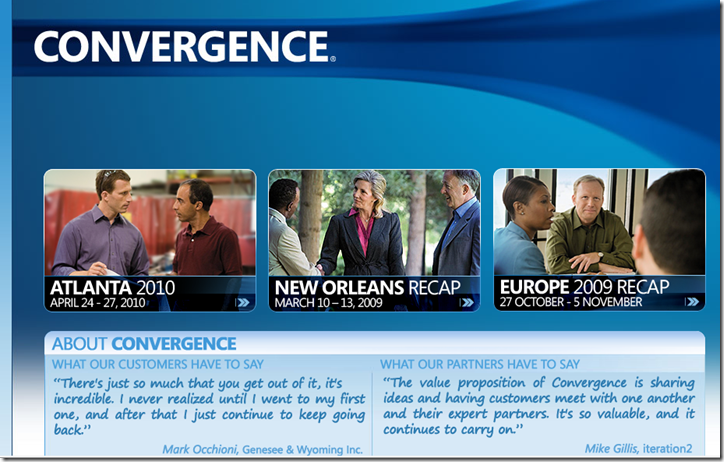 At Convergence 2010, the annual Microsoft confab for Dynamics GP (Great Plains), SL (Solomon), AX (Axapta) and NAV (Navision), Microsoft showcased a number of integration points between its new Dynamics GP, Dynamics CRM and other Microsoft tools such as SharePoint and Azure Portal tool. Approximately 8500 attendees made it to this relatively upbeat event. Of the demonstrations I saw, Microsoft showed how Unified Communications (UC) were part of most Microsoft applications and tools. For example, they showed how their cloud-based CRM product would integrate with their on-premise or hosted Dynamics GP product. If a user needed to contact a creditor, accounts receivable clerk or other individual, all that was required was a click on a small screen icon to launch a telephone call, email or video conversation. The Dynamics GP product was enhanced with additional BI (business intelligence) reports, enhanced Excel Pivot functionality, 15 new tailored user roles and more embedded Microsoft Office forms. In total, the product ships with 380 web services and 400 SQL or Excel reports. The other Dynamics products were upgraded late last year. One of the demos gave attendees a peak at the new Windows Phone 7 user interface. Unfortunately, it was a very brief peek. Dynamics CRM Online has multilingual support and will be sold in 32 markets by year-end. Overall, the products showed well and offered a mix of on-premise and SaaS products. Microsoft has stated that they are “All-in” when it comes to the cloud. – Multi-tenancy isn’t really there yet for the Dynamics GP products. The products can be hosted by third parties with prior enhancements getting easier and easier to roll forward to newer releases.